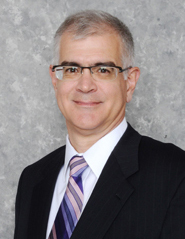 Dr. Vasdekas is a Board Certified General Surgeon serving the Southwest Suburban Chicagoland area since finishing his surgical residency at Mount Sinai Hospital Medical Center Chicago in 1988.
experience in Illinois. He is designated as a Proctor by Intuitive Surgical/ da Vinci. Dr. Vasdekas is a member of Midwest Institute of Robotic Surgery at Silver Cross Hospital. As the Cancer Liaison Physician to the Commission on Cancer for Palos Hospital he is a leading advocate in providing and ensuring high quality Cancer care for his patients and the community. Dr. Vasdekas is a member of The Midwest Institute for Robotic Surgery. The program performs more surgeries – including hysterectomies and complex procedures to treat colorectal cancer – using robotic-assisted technology than anyone else in the Chicago area. Dr. Vasdekas strives to provide comprehensive, high quality, safe, surgical care to all his patients.